If loosely translated you could associate five of the seven deadly sins to clutter. This may seem a bit like hitting below the belt but sometimes that’s what it takes to make people realize the error of their ways. Pride – otherwise known as vanity is a sure trigger to the collection of numerous unnecessary items. How many things do we buy just because we want others to see how trendy, clever, sporty, rich, beautiful… that we are. We don’t use these things in the privacy of our own home, we just want the world to see we own them. Let me give you some examples – Prada/Coach/Guess handbags, the latest apple iPhone, updated sport equipment, expensive jewellery, and trendy clothes. Not one of these things is a necessity and soon enough is no longer “cool” either and out we trot to update, leaving the previous items to languish in a cupboard somewhere. Envy – How often do you see that person I spoke of above sporting the latest and greatest and feel that nasty thing called jealousy rare its ugly head? So out you go and follow suit buying the same things to keep up with the Joneses whether you can afford it or not. This is a direct route to a house full of guilt clutter and huge credit card debt. Lust – although truly related to lust of the body there is no doubt you could also draw a parallel between that and lusting after the pretty, shiny, trendy, latest and greatest products available on the market. Shopping certainly satisfies a desire to make yourself feel good even if like any carnal act the satisfaction doesn’t last long before you are out there again seeking more of the same. Greed – the desire for material wealth and gain pretty much speaks for itself. It is really just a combination of all of the above. No matter how much we have we always want more. Sloth – the avoidance of physical or spiritual work. This is a two part sin that once overcome can be our salvation. First of all, once we have accumulated all that stuff to satisfy the other four weaknesses, we become too lazy to deal with it. These possessions start to pile up around us and we are either paralyzed by our guilt or just can’t be bothered to do what needs doing to move them on, and before you know it you are drowning in a sea of stuff. We have neglected to work on our spiritual or mental wealth and given in to desires that won’t sustain us in the long term. Fortunately, there is a cure. If you take the time to do the spiritual or mental work required to rid yourself of the desire to constantly have more, keep up with the Joneses and be something you are not then you will find you no longer need all these material substitutes for true satisfaction in life. Discover the things in your life that are dragging you down and substitute them for things more spiritually or mentally satisfying. Maybe it is your career, a relationship or physical neglect that you are not happy with. It isn’t always easy to identify or solve the problem but it is certainly worth the effort to try and the benefits when you succeed. 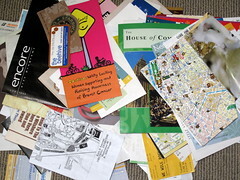 The last of the travel keepsake clutter has gone into the recycling bin. The lessons I have learned from this decluttering experience – without them I would still be making the same wasteful mistakes. 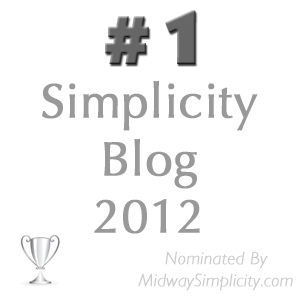 Email, text messaging and blogging – because when you have lost your voice you can still communicate. My husband – he likes to be the knight in shining armor. The gift of hearing – all I can hear right now is my computer whirring, my fingers tapping the keys and the clock ticking but I still know what a gift my hearing is. Bird song – I especially love to hear the magpies warbling and the kookaburras laughing. Interesting post, nice job. And I hope you get your voice and your good health back soon. I did consider that gluttony but it did seem to be too related to gorging food rather than hoarding food. Then again it did turn lust around to suit myself so why not. After all being dissatisfied about weight issues is one of the reasons people shop to make themselve’s feel better. I’m with Jo–you can indeed add gluttony and anger. I know I’ve done spiteful shopping before, and the appetite for shiny new stuff is one that is encouraged in this world. All told, though, buying and accumulating for its own sake is a moral black hole. It’s almost as if uncluttering and then choosing to live more simply and mindfully is one of those “Arise, and sin no more” catharsis-type actions. Hmmmm…. I agree with all you have to say here. It is really important to get the message across that in order for decluttering to work one can’t keep replacing the clutter with something else. Good post, Colleen. You hit it correctly whether it makes people feel guilty or not; and yes, I agree that you could add anger and gluttony to the list. Clutter is just the outward manifestation of what is going on inside your mind and soul. The idea of leaving the black hole is true too, I think. If you only get rid of junk out of guilt, etc, without an understanding of how the junk got there in the first place, you’ll just rinse and repeat, over and over. rinse and repeat; I like that. I know how many times I have had a good clean out of unwanted things in the past but have not learned the lesson and was wallowing in a hole new collection of clutter soon enough. I am a pretty thrifty person so I can only imagine what sort of mess one could get themselves into not only with clutter but debt if they weren’t careful. A very thought-provoking post Colleen. I know from my decluttering experience that the more I rid myself of external trappings the more I’m forced to confront myself. Frankly, at the moment I’m not really loving who I am. Time for some serious spiritual and mental work. Sigh, but it’s *so* hard! look at it like this; you are learning as you go and that can only be an improvement so you are working on the spirtual and metal issues without even realizing it. So don’t be too hard on yourself. I am not satisfied with where I am in some areas either at the moment but I know that changing is a process and I am prepared to work at it one step at a time until I am satisfied I am in the right place. just think of this as the first day of the rest of your life. If is never too late to turn over a new leaf. So don’t beat yourself up over what has gone before just get on with the new life you want to live starting today. It seems like you are making a good start so just keep going from there. Believe me you will learn a lot as you go along and one day you’ll look back and wonder where did the old Patty go and be glad you made the effort. So much wisdom and food for thought in this post and the comments. I agree that gluttony and anger could also be included. Gluttony could be interpreted as wanting, having, or accumulating an overabundance of stuff and not knowing when to stop. A person who clutters their life with stuff might get angry and defensive if those things are perceived to be threatened in any way, for example: theft, damage, loss of a job, etc. Makes you realize what a snowball effect can come about from letting clutter rule your life. So glad I’ve decided to take control of the clutter in my life. this one really does get you thinking doesn’t it. Like you I am glad I decided to take control of my clutter. Even though most of my clutter was out of sight it certainly wasn’t out of mind.